Planning on training for your next marathon, maybe you want to travel, or even just ship a package to another country. Sometimes you need to convert different units of distance to get the answer you need. Instead of busting out your dusty calculator, try using the free Distance Calculator Template instead. This document gives you the right tools to quickly enter the information you have and calculates that data to give you the figures you need. The free template file is everything you need to become the master of distance. Learn more about this great template by reading the instructions below. 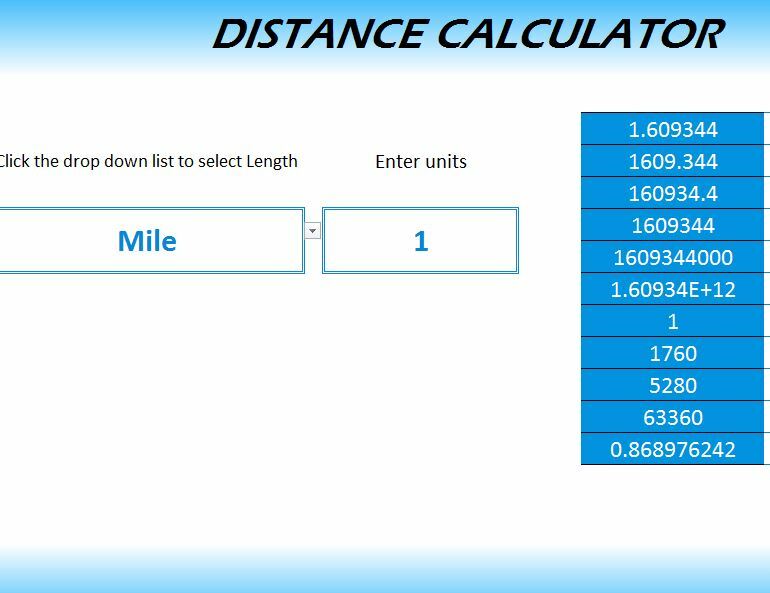 When you want to download the Distance Calculator Template, just follow the link we have provided for you at the bottom of this page. Next, you will need to get an understanding of the layout to learn how to use this template, but don’t worry, it’s still very easy to use. All you will need to do is enter the unit of distance you want to convert in the first cell of the document. There will be a drop-down menu that provides you with a list to choose from. Next, just enter the number of units and you’ll be all set. Looking at the table to the far right of the document, you will see that all the conversions you need have already been made for you. Just scroll through the list of units and find the one you want. To the left of your unit, the conversion from what you entered will be listed alongside it. Now you can be prepared to make any distance conversion you want with this free template. Receive multiple conversions at once.